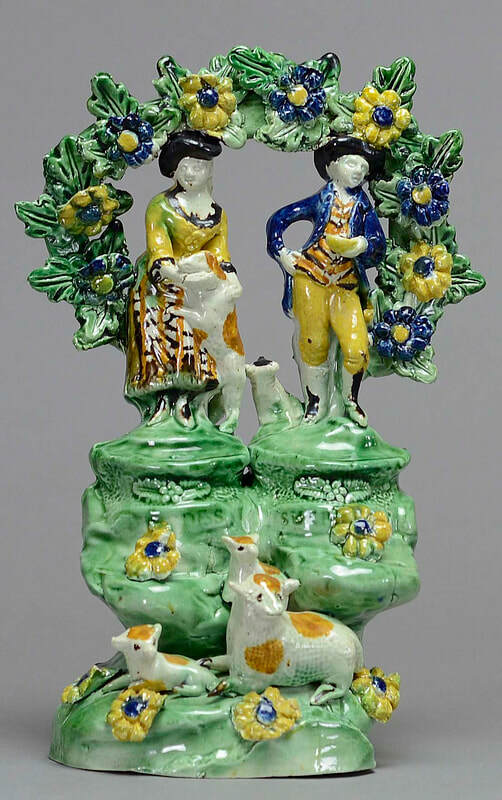 This information supplements the detailed information in Staffordshire Figures 1780-1840, Vol. 1. 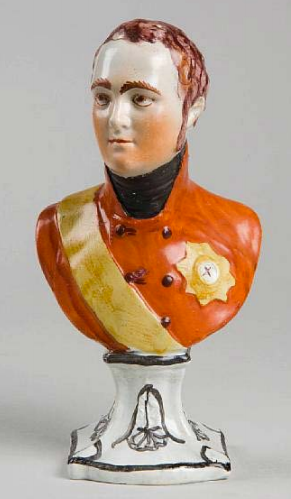 Most Tittensor figures are decorated in underglaze colors, but four enamel-painted Tittensor figures and one bust are recorded, all being so very different from the marked underglaze figures that I question whether Tittensor made them. I posit that some other potter made them using Tittensor's molds (the mark was integral to the mold) after he ceased working. 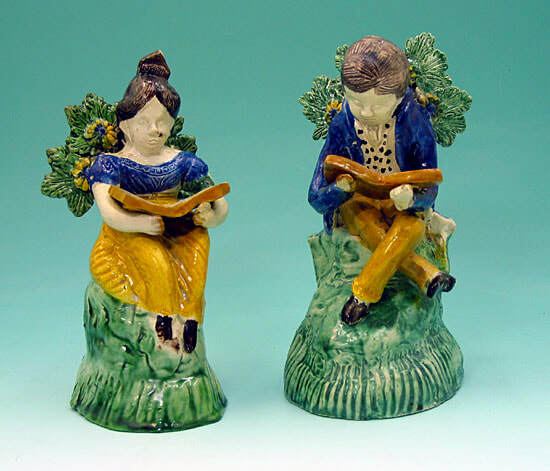 Note that two of these enamel-painted figures (reading boy and Turk) also occur in underglaze colors. 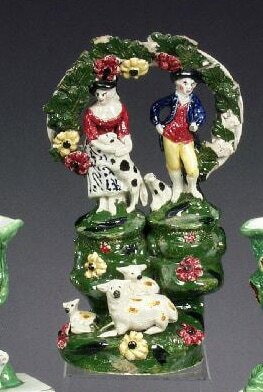 However, the bocages on the enamel-painted figures differ from those on their underglaze counterparts. Their distinctive twelve-petalled bocage flowers are otherwise recorded only on multiple figures marked Dale, as well as on a lone sheep marked "Sellman." Could Dale have bought the Tittensor molds and made the figures, adding his bocage? 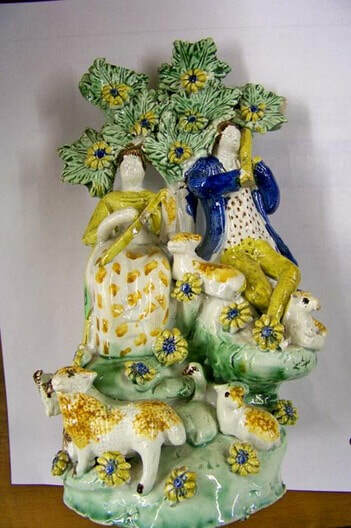 The bright green color associated with Dale occurs on two of these four Tittensor figures. The unusual tooling or stippling to the base seen often on Dale figures is on one of the Tittensor figures. I hope more marked Tittensors will come to light to further this research. These colors are very atypical of Tittensor. (c) Tennnants. In the Tyne and Wear Museums. Image from www.tittensor.com. Courtesy Paul Tittensor at tittensor.com. From “Staffordshire Pottery. The Tribal Art of England.”, Anthony Oliver, Heinemann 1981. Courtesy Brighton and Hove Museums. From www.tittensor.com and taken from “Tittensor: Black-Printer and Figure-Maker”, Reginald G Haggar, Apollo vol. 52 (1950). From Godden, “An Illustrated Encyclopaedia of British Porcelain & Pottery” and from www.tittensor.com. The snip below is from the great Tittensor site at www.tittensor.com. The dandies in the center image are the same as the pairs to the left and right. Both are marked TITTENSOR. Center image “An Unrecorded Family of Potters”, H Boswell Lancaster, Apollo vol. 37 (1943), 136-7. Right image:  “An Illustrated Encyclopaedia of British Porcelain & Pottery,” G.A. Godden, Herbert Jenkins, 1966. Left image “British Porcelain,” G.A. Godden, Barrie & Jenkins, 1974. 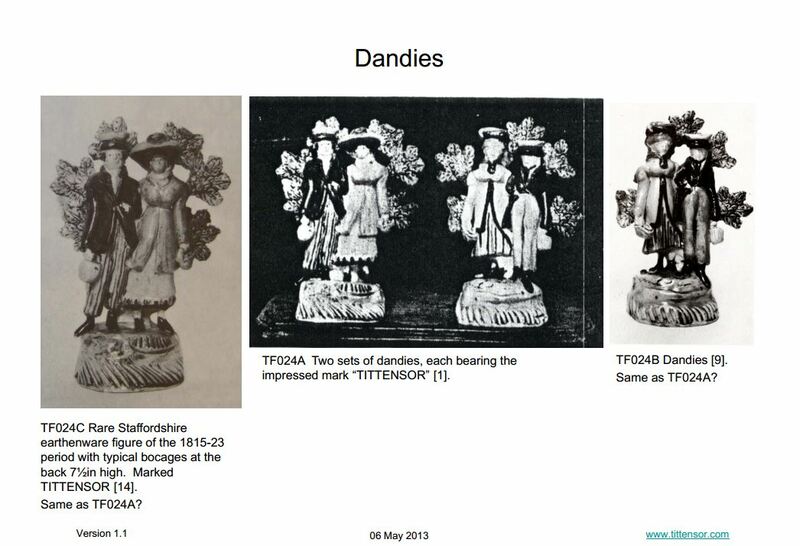 The copyright on the snip below belongs to Paul Tittensor, Mr. Godden owns the copyright on the images to the left and right, and Mr. Boswell's descendants own the copyright on the center image. From Halfpenny, "English Earthenware Figures 1780-1840." This Tittensor group uses a bocage leaf not found on any other group. It seems to be the form I have dubbed a fern leaf, and John Dale used it too. This strengthens the link between Tittensor and Dale. Also, best I can tell, the base is that bright green that Dale favored, yet Tittensor did not. All in all, the group is surprisingly restrained for Tittensor. From the Tittensor site at www.tittensor.com. It is from “An Illustrated Encyclopaedia of British Porcelain & Pottery” by G.A .Godden and is Mr. Godden's copyright.. 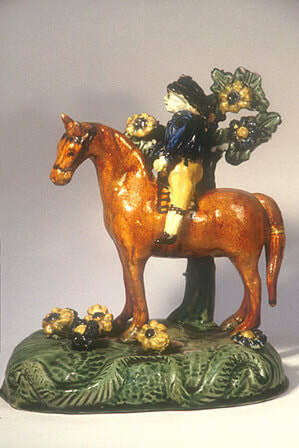 The boy is the only underglaze Tittensor figure that also is found decorated in enamel colors. Courtesy John Howard. Image from Lewis, "Pratt Ware." Impressed "TITTENSOR" In the Tyne & Wear Museums. 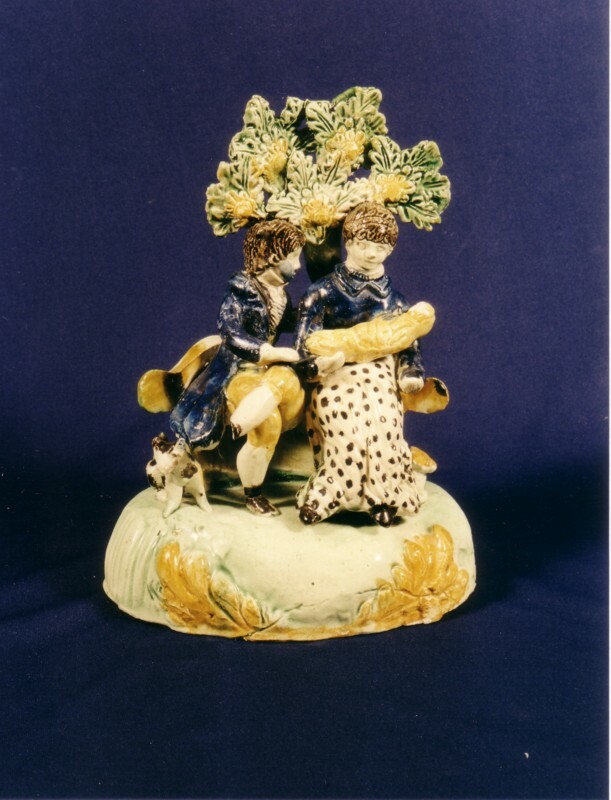 Image from Halfpenny, "English Earthenware Figures 1780-1840." Impressed "TITTENSOR" In the Tyne & Wear Museums. I am unsure whether this is a more recent image of the previous figure, with subsequent damage. Image (c) Paul Tittensor at www.tittensor.com.